NeoFarms Supercritical Co2 Extractor - FREE Shipping! The SFCE Botanical Extraction System functions as a bulk-scale, high-pressure separator for collecting extracted compounds. 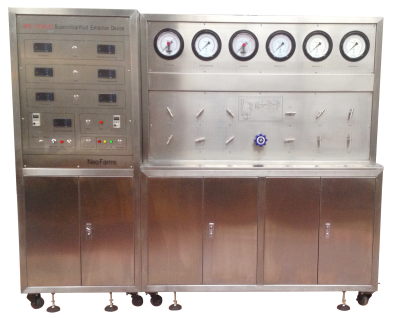 It provides extraction efficiency and selective fractionation of an extract in a single run. With the SFCE BES, you’ll see increased consistency of final product, from run-to-run. Because of the ability to run at increased pressure, extractions can happen faster – up to four times faster than in other systems – and at a decreased temperature, which means cleaner extracts due to less decarboxylation. Because of the ability to run at increased pressure, extractions can happen faster – up to 5 times faster than in other systems – and at a decreased temperature. 1.1 This system is multi-function SCFE equipment, the working mode is intermittent or continuous way to extract solvent from solid or liquid material, the additive can help extract non polar materials co2 cannot. 1.2 The system has one extractor and two separators. The whole equipments beauty, safety and easy operation, pressure temperature flow number can be seen from pressure meter and digital instrument. The material of pipe parts, valves, pipe lines, are all stainless steel(0Cr18Ni9Ti). CO2 storage tank: Air cooling, volume 24L, Max working pressure 2320 PSI (16MPa), with jacket and coiler double chill design. (1) The pressure pump has pressure limit control, set it among desired working pressure range, and pump stops. (2) The extractor, separator, CO2 storage tank have safety valvea to keep system within set highest working pressure. Material tank load and unloading. Opening and closing of extractor and separator. How to use the dry purifier. The parameter setting and physics meaning of all controlling component. The operation of high pressure valve control, flow adjustment, temperature setting, pressure balance, and so on. The daily maintenance program and method of this device.